"The personal touch in Antwerp". This sentence tells you about everything you can expect at the Plaza Hotel. On top of the beautiful Victorian decoration the rooms offer you the ultimate luxury ... space. 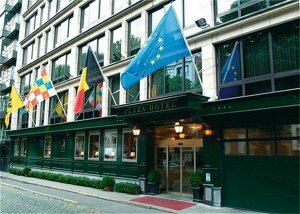 In the city center, next to the central park, within walking distance of shopping and historic quarter, easy access to all highways, 20 m from metro station, 500 m from central station, 1 km from fair grounds, 4 km (8 min by car) from Antwerp airport (ANR) and 40 km (20 min by car) from Brussels airport (BRU). Limousine service for Brussels airport available.